This past week on September 4th, I spent much of my day crying . . . but not for the reasons you might think. Backtracking a bit, for anyone who’s been following this blog since I began it back in January, it has kind of been a really great freaking year for me. From starting my YouTube channel to London, from Scotland to MISTI Con, from my first Camp NaNo to Orlando for Geeky – it’s been a wildly excellent 2015 I’ve been having. Sure there’s been plenty of downs in that time frame, but for the first time in forever, the amazingly good is outweighing the bad in such a way that it’s much harder to get me down right now, when I have so many happy memories to make patronuses with. The night before, we had just begun a campaign with MuggleNet called #PotterItForward, in which we’re encouraging people to leave a note about their positive experiences with the story in a copy of Harry Potter at a bookstore or library, so that a new person picking that copy up can know what a life changing tale lies between the covers of what they’re holding. I think it’s brilliant, and I am so proud of my friend at the site who came up with it. 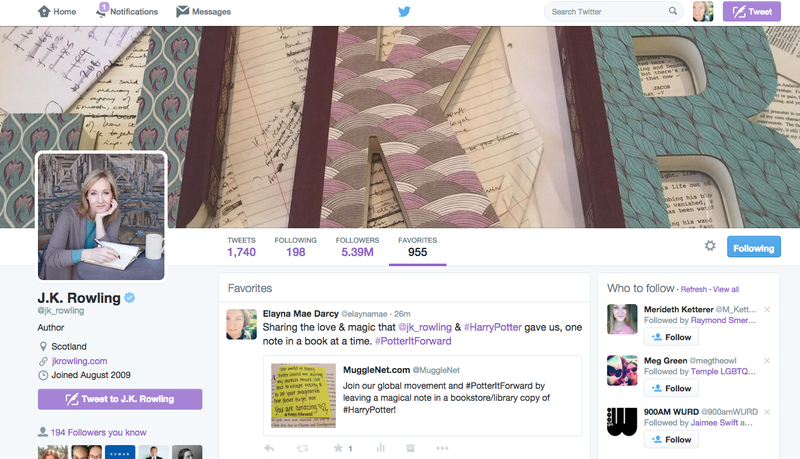 It’s one of those things that reminds me why the Potter fandom has always been so important to me – we’re all about the love & feels. So naturally, when I saw Queen Jo tweeting, I decided to tweet at her. I’ve done it plenty of times before, but she never has interacted with one of my tweets before, which tbh I don’t take personally. 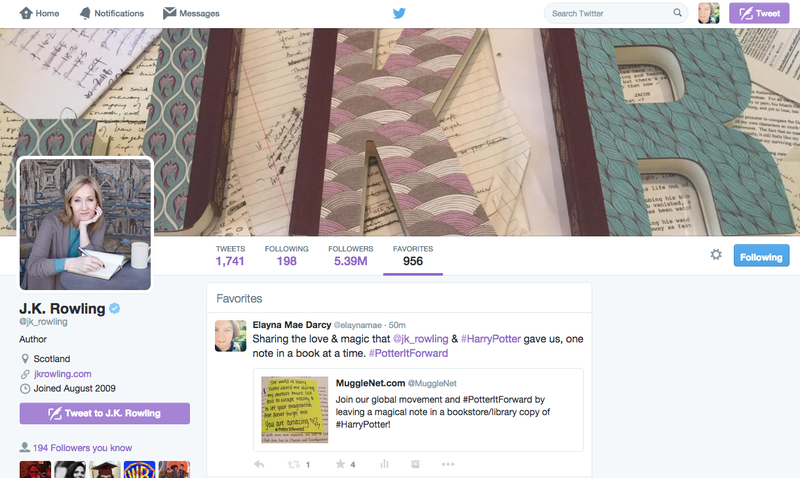 The woman’s got over 5 million followers on twitter! Everyone and their mother tweets at her, and probably hundreds of thousands of people have their phones set up to know when she tweets, just like me. Every time I tweet to her, it feels like a shout into the void, but I’ve continued to do it every once and again hoping she catches it. I’ll be honest in saying I pretty much immediately started crying. The really good kind of crying. The kind of crying where you’re more so crying for the sheer disbelief that such beautiful moments could happen in your life. 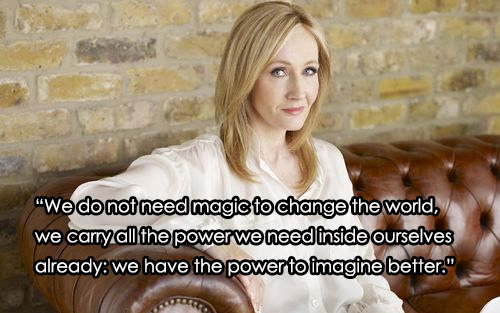 I have looked up to J.K. Rowling since I was an 8 year old girl who fell in love with a magical story. The more of her books I read, and the more I learned about her as a person . . . there was just so much about her to admire and respect. And for just a moment that morning, the woman who’s inspired me more than anyone, saw a lil icon of my face, read the words that I had to say for a change, and liked it so much she felt compelled to give it a little gold star of approval. Me, myself, and I at that moment. Some people might think it’s crazy for me to have reacted in such a way – crying, having trouble breathing, being incandescently and ecstatically happy for the entire ensuing day – but if J.K. Rowling (and Luna Lovegood) have taught me anything, it’s to not care what others think of you, especially if it means not being yourself. After a night of not being able to sleep, having a mediocre day at work, and then a night spent mostly online talking to my MuggleNet friends who mean the world and a half to me, I found myself sitting alone, and I once again started to cry. Like really, genuinely, happy cry. But the reason, I realized in that moment, was not just because some author took 2 seconds of her morning to like a tweet. I’ve been happy crying because I have reasons to. While I have spent so, so much of my life, crying because of depression, anxiety, loss, rejection, self loathing, and a million other things, I have finally reached a point in 2015, where I have so many loving, genuine people surrounding me and filling my heart with joy and reminding me that I’ve got so much light in me that I can share, but only when I stop to realize I have it. I’ve got a job that’s okay with an apartment that I love, I’m giving back to my school through an amazing LGBTQ Alumni group, I’m starting to lose weight and feel healthier, I’ve traveled to two new countries and two different states in the last five months, I’m working for the Harry Potter fan site I’ve loved since childhood, and I’m writing again. Writing a story that’s been with me for 11 years, and which most recently helped land me a leadership position as one of the Municipal Liaisons for Philadelphia for this fall’s upcoming NaNoWriMo. How I feel about me and my life rn. No low balance in my bank account or any hate that anyone could try to fling at me right now can take that away. My happiness is so strong that it could hold back 100 dementors any day. I’ve got so much passion, friendship and love in my life right now that I can honestly say I’ve never felt this unstoppable. But all of this realization, came from a single little gold star on a tweet that I thought would never been seen.